The Ferguson FE35 (Massey Harris Ferguson Company) was manufactured from 1956 until part way through 1957 when production continued under the Massey Ferguson badge and red and grey livery of the MF35. The FE35 was painted in a distinctive contrast of grey tinwork and wheels with golden castings. These distinctive colours gave the tractor a list of names by which the machine became known…..
…..Grey Bronze, Golden Grey, Gold Bellies, Grey & Gold, Gold Standard, Golden Belly, Golden Bird, Goldbauch (Germany). …and Vintage Tractor Engineer really likes this one from Sweden – “Guldkalv” = The Golden Calf. The FE35 had some notable improvements over the preceeding TE range, including independent brakes, dual lever control of the hydraulic lift and deluxe versions were equipped with live p.t.o. and hydraulics. This live p.t.o. feature transformed the usfulness of the tractor as the p.t.o. speed was now independent of the forward speed, this been useful for tasks such as muck spreading, root crop harvesting, baling etc. One reader has sent in his ploughing memories using one of these tractors. The serial numbers are preceeded by three letters. Data specifications and torques are as for the Massey Ferguson 35. It is the distinctive silver and gold Ferguson badge that really finishes off this distinctive colour scheme. Sure we can help you out. We’ll e-mail you some help some time over the next few days. I too have a FE35 and am busy redoing the motor as it was spewing oil. Its a Vaporising oil motor, at least I think so because the carb has a 1578 stamped on it. Is there any other way of identifying the actual motor? I also see the only difference would be the S.R. Jet which is a 80 and on the petrol version is a 70. Another question is can one drive this tractor on Lead replacement petrol continuously. I have done so since I had the motoe and don’t know if that was the cause for the failure. And one last question, is the colour scheme Grey Gold or Grey Copper? Here in South Africa it was also known as the “Koperpens” Copperbelly. Mine does actually look more like copper and not gold or bronze. The VO, lamp oil and petrol engines are the same basic block (denoted 87mm bore engine. Different carbs are used with varying arrangements of SR jets. The other way to check the engine is through the serial number code. The first letter in the code will be S – standard, V – vineyard or J for industrial. The second letter in the code denotes the engine type G – petrol, H – high altitude petrol, D – 23C diesel, N – 152 Perkins diesel, K – vapourising oil, L – lamp oil. The 3rd letter in the code denotes the clutch type F – single clutch, M – dual clutch. The serial number is on the plate on the dash pannel. The VO and lamp oil engine are fitted with a thermostat to provide a hotter engine than for petrol only, this assists in the vapourising of the heavier fuel. If running on petrol only we would suggest making sure it has the correct petrol thermostat fitted. The thermostat fitted to ordinary petrol engines is 65-67 deg C (stamped on the thermostat). VO and lamp oil engines it will be a 95 deg C thermostat. So maybee you have been running on petrol with the incorrect thermostat and the engine has been getting too hot? Also remember that VO has a lubricating effect, wheras petrol doesn’t. hi there, i have a 1957 4 cyl 23c and have the same problem as Clyde here.i have done up eng and marked every thing i have pulled apart but i want to mark sure the marks are in the right place,eg timing of cam and injector pump, seems to be no factory marks to go by,hope you can help, Thanks John. it is a very tricky operation to time these engines. Trying to describe it in an email is almost impossible. easier to follow when you see it done on the television screen. probably the best way of showing you how to do it. i recentley bought a fe 35 with the 23c engin i have a small hole in the transmission belly pan looks like some one drilled it when the tractor warms up it leeks a lot of oil from this hole any ideals as to why or where the oil is comming from? The hole is factory made. If it’s coming out of the splitpin hole in the clutch housing it can either be engine oil or transmission oil. Take the panel off underneath and look in with a torch to see if there is an obvious source of the leek. Either way you will need to split the tractor between the bellhousing and the clutch housing to replace the leaking seal. You will probably/possibly need to replace the clutch if any oil has got onto it. Hello, the 3x point linkage and front loader on my 1957 4x cylinder diesel Mf35 have stopped working, all happened out of the blue, just worked one day then not. I changed the oil which was quite milky, front loader went up once then no more. 3x point kind of tries to rise (judders)but has no power. Any pointers as to where to start looking.? Best regards David. the necessity to change the oil every 12 months. Click this link to see what happened with this FE 35 tractor hydraulics problem. Hi, The info might be on here somewhere, but I’ll ask in case. I’m new to this vintage tractor game! I have an FE35 petrol and I have lost the oil through the spool. What oil spec do I need to replace it? The transmission oil should be 30.28 litres (6.6 imp gallons)of SAE 50 oil. This is for an oil temperature of 43-60 deg C. If the oil is usually cooler than this then it would be acceptable to use a lighter grade of oil. In practice a modern universal tractor oil of 15/30 or 15/40 will be OK in most conditions. I have a MF35 with the 23C four-cylinder diesel engine. While these engines never started easily, this engine is getting particularly hard to start. I have heard that it is possible to fit a different starter motor, which turns the engine over faster than the original starter motor, and ths improves starting. Does anyone knoew if this is true, and if so, what starter motor can be fitted? 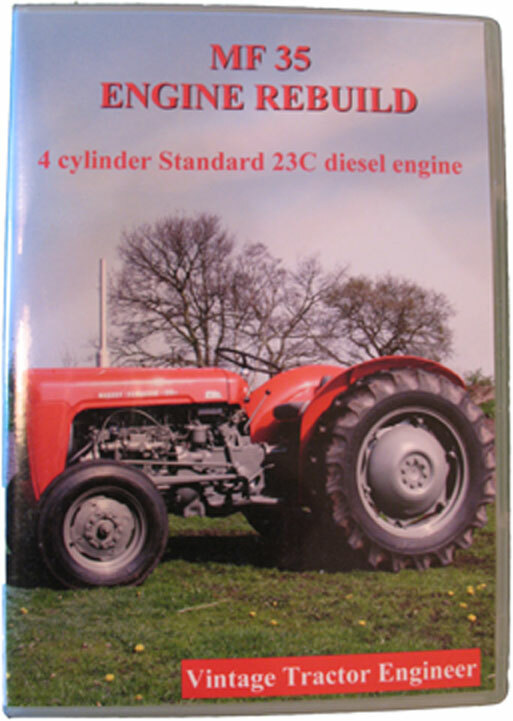 Where could I obtail the DVD mentioned above which shows how to set the timing on the diesel 23c engine? All the info about the DVD is on this page. Can You tell me in wich year this machine is manufactured? You can find all that information on the Serial Number page. Can anybody tell me when the old “Ferguson” logo in the front of the hood was changed to the well-known three triangular MF logo. I think it was in the year 1958, but when? I have not got to the bottom of this either. I know that Massey-Harris and Ferguson merged on the 12th August 1953, and were known as Massey-Harris-Ferguson. The name officially changed in late 1957 to Massey-Ferguson (with a hyphen), but I understand that the hyphen was dropped early in 1958. I am under the impression that the Triple Triangle badge was first used early in 1958, but I do not know when exactly. HI, I recently purchased an FE35 serial no 15265, I thought I had a grey and red one as I didn’t have a close inspection of it at the time,(as I paid only NZ$600) When I got it home I put clean fuel in it and a battery and away it went,no smoke,everything works!, but on closer inspection I noticed a lot of the grey paint flaking off to reveal the gold paint, I had no idea they produced a gold 35 untill I found this great web site. Now I wonder If I have a great piece of history to look after! What I’m not sure of is why the gold was sprayd over in grey, it has the Ferguson 35 badge side and front, and why the panels are red, or is this an undercoat and the grey worn off. Also there are 3 MF badges (stick on) below the lights and on the seat. The serial number of your FE35 dates the tractor early in 1957, and it souds like you’ve picked up a bargain. There seems to be quite a few FE35’s about that have been repainted grey/red – I don’t know why. The red paint is not an undercoat – if they are the original panels then you should find the grey paint underneath. As for the gold paint; well actually gold is a bit of a misnomer, the actual colour is best described as copper. Also I understand that the grey is a slightly lighter colour than of that which is found on the TE20 Grey Fergies. Everything should be painted the copper colour, with the exception of the bonnet assembly, the wings and the wheels. The axles should show through the wheels as copper, and the wheel nuts were originally grey. These tractors are real head turners when they are in the original colours. Hope you get time to sort the paint job on this one. (England) it first appeared on November 19th, 1957. I have a 1957 FERGUSON F-40 without the emblem and a late 1957 Massey Ferguson 50 WITH the emblem. 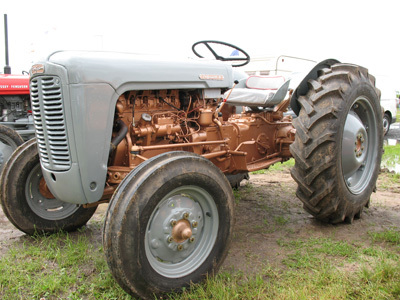 Dear sir, In answer to e mail no 20 ,I have a 1958 fe35 in red & metalic flint grey , 1st reg 24/6/1958, serial no sdm 102146 , this tractor was purchased from Lenfield eng kent ,reg no 822 ckr , massey haris ferguson on commission plate and badged ferguson on front of bonnet in one piece,all of badge chromed no colour in background of badge .Hope this is of use to you . regards hammer man. Hi, I would like to know the cc of a FE35 23c diesel engine as I,am filling in a DVLA 55/5 for an age related registration number. The 23C engine is 2259cc, or 137.89 cu ins. I have a fe 35 Ferguson engine no. sj13243ed. First sold in Scotland serial no. is not readable. I am trying to trace a registration number for this tractor, maybe someone could help me. I have recently bought a restored FE35 Grey and Gold SDM 29018. I note your site with interest, particularly your detailed explanation of the years of manufacture and colour schemes. You say in one of your replies to another questioner that the gold is in fact more of a copper shade and that the grey is lighter than the preceding TE series. Would you happen to know the paint reference numbers and the names of any UK suppliers? If you look on the lower right hand side of the dash panel near to the ignition key there should be a metal plate. The serial number will be on the bottom of the plate. There should be a date stamped on to the side of the transmission housing. I bought fe35 over 12 months ago doing work myself. She has a pick up hitch on rear i cannot for the life of me find a T bar for the three point linkage for operating the pick up hitch could you please help. Im in ireland but willing to travel for it. Sorry to say that we haven’t got one at the moment, but have you tried the small ads in Tractor And Machinery magazine. Another suggestion is to look on ebay. Hello – I am on the search of the paint codes for the Grey/ Gold version. MF in Norway will not give me this code. Does any of you know what color codes to use? I have read that the NAPA codes are 99L3740 for the grey and 99N-22138 for the Bronze/Gold. There isn’t a temperature gauge on the diesel tractors (or a sensor). Only the non-diesel variants have the temperature gauge. I there i just a bought a frontend loader/backhoe base on a fe35 for my hobby farm.besides being base on a fe35 and haveing a 4 cylinder diesel i have no idea what year it was made and what model it is iam only going by the fe35 on the hour gauge. The complance plate has been pulled off i herd it has been made in france. iam sure its a fe35 but it has a different front body. steven. Iam from Australia and bought a FE35 tractor a couple of months ago and need to confirm exact model so I can get the paint job right. The compliance plate cleary states FE35 just above the s/n, which is SDM 77754. This makes it a 1957 model. The Tractormeter clearly states FE35 at the bottom of the gauge. The transmission is clearly stamped 2.12.57. 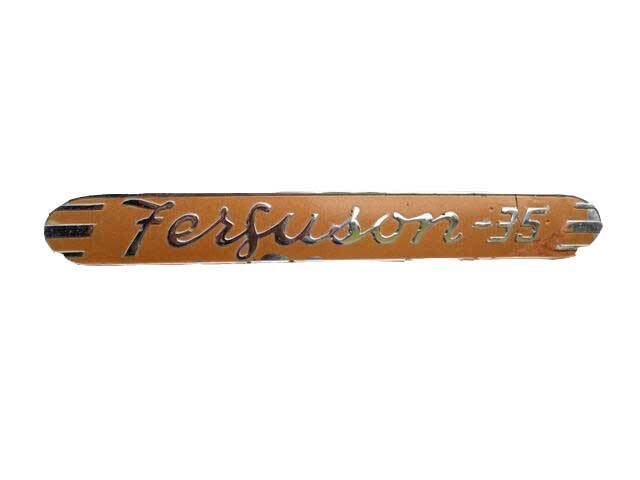 There are old decals on each side of the bonnet painted over but still visible stating “Ferguson 35?. So it should be an FE35. But according to the s/n table the FE35 was only manufactured to s/n 74955 then became MF35. As my s/n is 77754 this would make my tractor an MF35. But everything on the tractor says it is an FE35. However the date of manufacture at the end of 1957 might put it in the MF35 category. Can you tell my why an MF35 would be plated as FE35 or vica verca, and what colour should my model tractor be? It has a small heavy duty bumper bar at the front under the radiator, does that help? Hope you can assist. My ferguson plate is stamped FE35 and its serial number SDM74740 (23c engine) which is a later number than when you have advised they stopped the FE35’s. Any ideas as I’d like to buy a service manual. I have a couple of fuel drips leaking from the injector pump (I think that’s what it is)and I have no idea how to fix it !! new and it has FE35 on the plate. So I would suggest that yours is one of the first Massey Ferguson 35’s. It would seem that the first of the Massey Ferguson 35’s were painted red and grey, but still retained the Ferguson badges on the front and side of the bonnet – I imagine that yours will be like this. The Massey Ferguson badge didn’t appear until some time early in 1958. Look at this photo from late 1957 / early 1958. I believe i have a FE 35 Grey & Gold 4 cyl diesel. Can’t find serial #. If its on the metal tag on dash then I can’t read it. It has a tag 19.11.56 on right side of motor and stamps on gear box of 182.840 M1 and 183.253 M1 . Runs well, leaks a little diesal and needs new paint job. Steering arms really good. She’s been good for us for the last 8 years. I am thinking of selling, can you give me guide on price. I was thinking $3,500 ? Thanks Terry (Yarra Valley, Melbourne, Australia. Hi there, I have the same problem Terry has, the number is not on the metal tag, and we need to know the place where it is stamped on the chassis as well, so we can show that to the registration office. Anyone know where to find it? I am in the process of buying an FE35 Grey Gold. It is in very good condition, having being rebuilt quite recently. I am in Australia and looking for an owners manual (not a workshop manual). Any ideas? Diesel is dripping badly from the injector pump on my grey/gold. I have successfully tightened the oval plate with gasket on the outer face of the pump – this has screws fitted. Leakage seems worse from the corresponding oval plate on the inner face of the pump but this is virtually impossible to access without removing the pump -so far as as I can tell this plate also has securing screws rather than hexagonal nuts. I have tried in vain with a right-angle screw driver. In removing the pump I am scared of upsetting the timing. Do you please have any suggestion that would avoid the need to remove the pump? Is a repair kit available for these injector pumps. Also the tractor runs and pulls well but ‘breathes’ from the crank case pipe on the right side of the engine. Is there a possible cause other than simply a worn engine? Gaskets are available for the pumps. All you need to do to make sure that you don’t upset the timing is to note the position of the scribe mark on the pump mounting flange in relationship to any marks on the drive housing. If no marks are present then make one. You cannot get the shaft wrong because it has got a master spline. As for the breathing. It can only come from either down the side of the rings or out of the valve guides (less likely. If it starts and runs OK, then I would just leave it as it is. Otherwise you would need an engine kit and rebuild. just a note to answer any query on when the massey ferguson badge was first used. the first mf 35 was produced on the 5th of december 1957 but retained the ferguson badge until serial no. 107892 which was around june 1958. the six stud half shaft housing used on the gold belly model was used on the first 2972 mf tractors before being replaced with the 12 stud type. the old style bonnet with the push buton mechanism was used until 1959 at serial no. 141140. Hi I was wondering could you help ? I have a goldbelly ferguson that I got new mudguards for but am finding it very hard to get the right grey to match the rest of the tractor? Any idea on colour? Also my serial number plate is missing! Is there any other way of finding out age of tractor ? 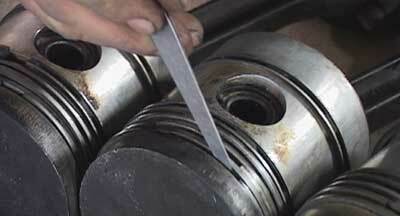 The standard crankshaft journal measurements are 2.7520 – 2.7515 inches (69.901 – 69.888 mm). Similar tolerances for re-ground crankshaft to 0.010, 0.020, 0.030. 0.040 inches (0.254, 0.508, 0.762, 1.016 mm) undersize. I presume you have a 23C engine (4 cylinder diesel)? We do not know of anyone who produces a new camshaft for these engines, so you would need to look for a second hand one. If it is a Perkins engine then new camshafts are available. Thanks for letting us all know about this. Just browsing through some questions/comments here and just to clarify that I fitted a new Ford 4000 starter to our FE35 4Cyl (22.8.57)…… It makes a tremendous difference, I only had to grind the necks down (vert slightly) of the starter bolts, (diameters on starter slightly smaller). But the tractor turns quicker and starts like a dream compared to before. The identification plates on the dashboard all refer to the tractors as FE35, no matter what colour or age the tractor is. The ID plates were never changed, all saying FE. Ok, im confused, you say the FE model was cancelled in -57 and replaced by the MF in -58? My Ferguson with serial SDM 124096 says its and FE, not an MF. I believe the plate is authentic and the color looks like its been red/grey but that could be wrong as it looks repainted on some occations. Can someone help me understand what model my Ferguson is and where and when it was made? Thankful for any help i can get. i have a 35 serial number 117513 which i believe is 1958.
i have a fe35 petrol , that have just restored after a few years . it ran great when i dimantled it but now it wont run . i note also there doesnt seem to have any fuel on the plugs ? hi steve, where is the differential filler plug on an fe35? also what type of oil do I use to refill? Leone, I cannot help you with the mechanicals of your diesel, but the tractor I have, which is also in Australia, has serial number SKM 26357 and gearbox casting 24.1.57 making it very close to yours in production. Mine is also body red and castings/engine grey and I have always assumed this to be the original colouring. As it has aged however, the gold/copper colour is definitely evident under the grey, and where the red is wearing or peeling off, the sheet metal work is clearly grey underneath. There seems to be many red/grey tractors which should be grey/gold according to their serial number, especially in Australia. Karen’s post also suggests hers is gold/grey overpainted grey/red, but does not indicate what country it is in. Karen, the advertising brochure held at Museum Victoria (Melbourne Australia) shows the grill is grey like the rest of the sheet metal work (see link). I have been investigating these gold/grey tractors on every website I can find and it seems that many have been overpainted grey/red, especially in New Zealand and Australia. It makes me wonder if Massey Ferguson did this on import. I would be interested in others’ thoughts about this. For your database. I live in NSW, Australia and have an MF35 with casting date 28.11.57. The front badge is the Ferguson badge and it has been red/grey since my father bought it second hand around 1969. It had not been repainted at that time. The dataplate gives the serial number 78544 making it the 3888th off the line. One of the 35s had the registration TRW 387 which I believe is Coventry. And we also later got a 65 – again I have a B&W photo. I worked on a farm in Sussex where, I was told, some of the first Grey / Gold 35s were used. It was said they were supplied directly by MF from Coventry. We were reclaiming land that had never been ploughed so they were worked hard. This would have been around 1956. We had 2 ordinary ones, with narrow front wheels, and one de luxe which had wider front wheels. I have a couple of black & white photos should anyone be interested (tractor at theale.co.uk). Incidentally I now do a lot of work in the former Yugoslavia, where MF 35s were manufactured under licence under the name IMT. There are a huge number still working (though all red, not grey), so I imagine spares would be easy to get – e.g. in Macedonia, Kosovo, Serbia etc. hi , my partner and i bought a fe35 which was painted red but found out it should be a grey/gold we are restoring it which so far going quite well and will be painting it back to grey / gold but have a query 1. what colour should the grill be grey or gold ? and motor number sg2677ed from date 7-6-57. It’s a petrol/benzine. Can you tell us if it is a gold/grey or not? No myne was I think a grey/gold but he was repaint in red. I can see the rims inside are grey and also the enginecap inside. What I want to find out is why it won’t start, and from more reading on this site it seems I have a grey/gold FE 35 and want to restore it, remove the red paint and go back to the grey which is under the red paint. Is yours grey gold? I’m in Australia and have a Massey Harris FE 35 SDM 25455 and on the carapace it has a date stamped 17.1.57 so I presume that was the build date in Coventry England. From your wonderful website I see, if I understand correctly, that these were sometimes painted red and grey with the gold belly. I can see this one has the remains of a gold belly and was painted red & grey. Should I stick to these colours? I’ve had an offer to buy it as it from someone who wants to do it up and resell it, but he isn’t a dedicated heritage minded fellow so I won’t part with it unless it’s going to someone who will restore it to the original. I would not know what it was worth anyway. I had the hydraulics redone a couple of years ago when we used it for slashing, but the mechanics told me it was an ME 35 so whether they did it properly is another matter. Now it won’t start, it’s been sitting undercover for a year, and I’ve had a friend take the fuel filter out and removed sludge from just about everywhere. The fuel is getting through until it gets to the fuel pump proper and yet it won’t ignite. I know this is very little to go on, but it used to work fine although we had to use aerostart to get it going. It has four cylinders and I know this is one of the drawbacks – my friend tried to jump start it by pulling it around with my other tractor – no battery – but I can’t understand how this would work. If you take a look at comment number 20 (above), you will see that the last FE35 was serial number 74655, produced in 1957. Lets presume that your dash panel and identification plate are original to the tractor. Then you indeed have a grey/gold tractor. Maybe the bonnet and wheels have been changed at some time in the tractor’s life. …this puts the date of manufacture at the latter part of 1956. It therefore follow that it was registered early in 1957. I beleive your tractor should be grey/gold in colour – which is such a fantastic colour scheme! As for the workshop manual, then I would suggest a genuine Massey Ferguson manual. In our experience the manuals produced by other companies do not contain all of the information necessary. The genuine manuals are more expensive, but worth the extra money I think. (It isn’t any good to have a workshop manual that only gives half of the figures, tolerances and specs – especially when working on the engine). 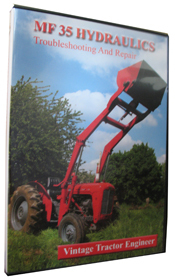 Workshop manuals are available from several tractor parts suppliers, but we have just ordered a supply in which should be available for sale soon. Thanks for leaving the comment on the website. The website has become an information resource because we get comments from people such as yourself. I have just purchased a Massey Harris Ferguson with the VIN number SDM7493. The V5 states that it was first registered on 02-01-1957. It has a Red bonnet, rear mudguards and Grey wheels. The engine/gear box is Copper. We recently had an injector that wasn’t spraying correctly. So instead of the diesel spraying and igniting it was dribbling down the cylinder and into the sump. We tested the 4 injectors, found the faulty one and rectified the problem. Hi, please could anyone help me my fe-35 4cyl has started leaking diesel into the sump, i have disconnnected the lift pump so its not that. Does anyone have any ideas. We have never used Comiskey ourselves, but a few of the DVD customers have recommended them. We use Park Engineering regularly and the quality of their work is excellent. Hope that helps and that everything goes well with your engine. When you have completed the rebuild let us know how it runs in comparisson to before. Hi, I have purchased your DVD on the 23C engine. I have recently bought a Grey Gold FE35 and would like to put a lighting kit on it. I was wondering what the correct Grey colour was to paint the new items. I was under the impression that it was Stonleigh Grey, the same as the TE20, but it looks so dark. Is this correct? Hi i wounder if anyone can help me. Ive recently picked up an fe35 for £300. Serial number is sdf 67325. And it was made in 1957. But i cant find out weather it should be grey an red or copper an grey. As it stands it has grey belly but ive flaked off some of the paint an it seems to be a copper colour. and same for the mudguards, they are red but underneath grey. What colour should it be :S ??? Hi guys need help regarding my steering on my Grey/Gold Fergy i am placing the shaft back in to the nuckle of the steering box it has 28 ball bearings in the box. Do i grease the ball bearings and place them into the nuckle so the steering actually works ??? Are there any links with pictures i can go too ? ?